WHAT MAKES GUNZOS THE SINGLE MOST REPUTABLE AUTHORITY WITH HOCKEY SKATES IN THE CHICAGOLAND AREA? Visit us in person to see the skate fitting experience yourself. We are one of the oldest hockey suppliers in Chicago but we are lightyears ahead of our competition with technology to help your skates have a perfect fit. 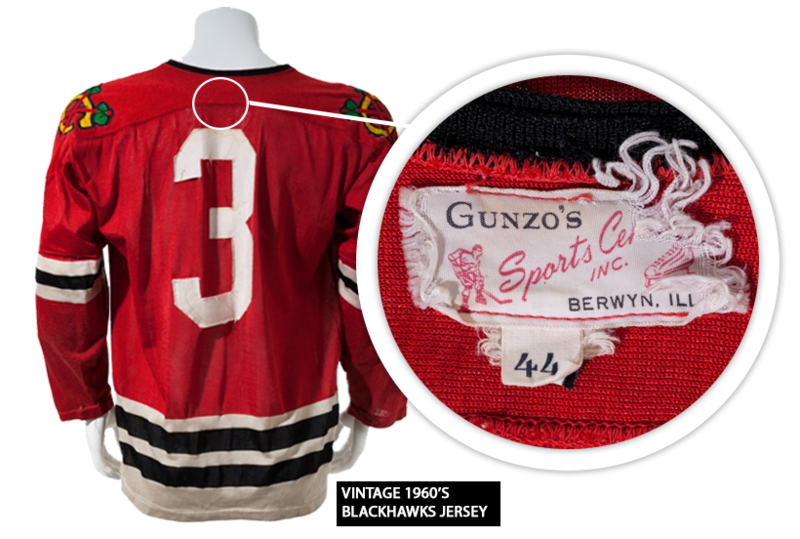 Gunzo’s offers a wide variety of athletic apparel such as hockey t-shirts and jerseys. We have one of the largest selections of Blackhawks jerseys throughout the Chicagoland area, which also comes with the option of jersey customization and personalization. To learn more about our products, pricing and turnaround time for jersey customization, call one of our Chicago locations! Gunzo’s offers an enormous assortment of hockey apparel from all the leading brands, including Bauer, CCM and more. You will find hockey jerseys, t-shirts, hoodies, jackets, sweaters, warm-ups, etc at any one of our conveniently located stores throughout the Chicagoland area. We even offer our own Gunzo’s branded gear. We understand the importance of looking sharp off and on the ice. So stop in and let us help you look your best! One of the most important items in hockey is having a bag large enough to hold all of your hockey gear. At Gunzo’s, we carry some of the most popular brand bags in hockey. From Bauer to CCM, we want all of our customers to be able to choose from a large selection to better fit their needs. To learn more about the products we sell, call today or visit us at gunzos.com. What goes better with a customized jersey of your favorite team? A matching hat. If you’re a hockey player or fan, you’ll love the wide variety of hockey hats we offer at Gunzo’s. We have NHL team logo hats, branded hockey hats, women’s hockey hats, beanies and much more. Gunzo’s carries hockey helmets and face protection products from Bauer, CCM, Bauer, CCM and other brands. Choosing a form of facial protection depends on how experienced you are. Full cage helmets are for amature hockey players; full shield, which is a plastic visor that covers the eyes and mouth with breathable holes, and the half shield is for players over the age of 18 in leagues that do not require full facial protection. Let one of our experienced team members assist you with finding the perfect mask for your level of play. If you are in need of Gamewear Jerseys, NHL Authentic Jerseys, NHL Replica Jerseys or Practice Hockey Jerseys, Gunzo’s is the place for you. We also have branded hockey shirts from major hockey manufacturers and hockey shirts with NHL and minor league team logos. As previously mentioned, we offer custom jersey personalization. Give us a call or stop in at any one of our Chicagoland locations to learn more about our pricing, time frame, and jersey selection. Hand protection should always be a top priority when you’re purchasing hockey equipment. It is also a requirement in every organized hockey league. With so many different brands and models available, it can be difficult to choose which model best fits your style of play. Gunzo’s offers some of the top hockey brands, such as Bauer and CCM in senior, junior and youth sized hockey gloves, all ranging from size 7” up to 15”. Here at Gunzo’s, we keep a large stock of some of the top brands for hockey sticks/ Whether you prefer to play with Bauer, CCM or Easton, no matter the brand, we will make sure that you get properly fitted for a stick. To learn more how we can assist you with getting you fitted for a hockey stick the right way, please refer to our “Get Fitted for Gear” page. 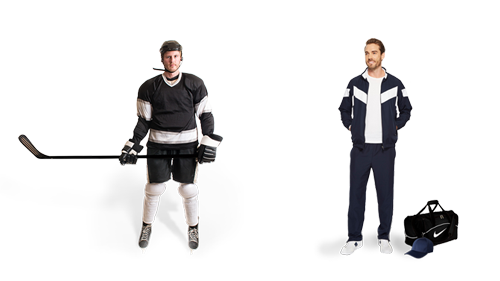 We sell hockey pants and shorts of all sizes, from senior to junior to youth. We also sell all major hockey manufacturing brands like Bauer, CCM, Nike and Under Armour in a variety of colors. To be a better hockey player on the ice, you need the right workout clothes. Gunzo’s has everything you need to make sure you are ready for your workouts with the proper apparel! 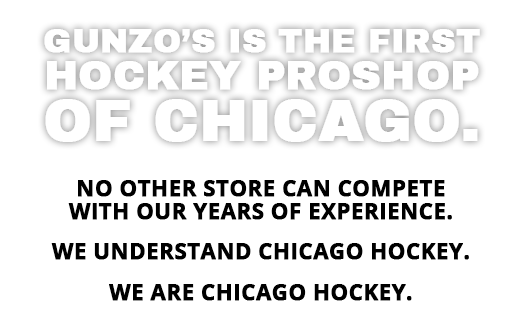 Hockey socks and skate socks are basic essentials of hockey equipment for every player, and Gunzo’s is the most trusted retailer for hockey equipment, apparel and accessories for beginners and advanced players throughout the Chicagoland area. Most socks are commonly sold in three distinct lengths: 20″ (Youth), 24″ (Junior) and 28″ (Senior), however there are extra sizes available. (For example, Intermediate and Pro.) 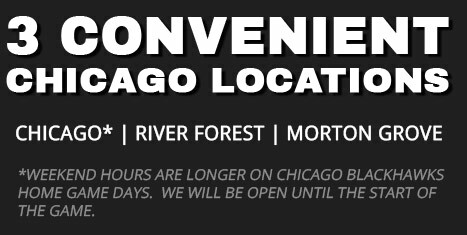 Give us a call or visit one of our convenient Chicagoland locations. Or visit gunzos.com for all of your hockey needs. Finding the right pair of ice hockey skates can be difficult without a hockey expert assisting you, but our team of professionals here at Gunzo’s are eager to assist you! We carry the best hockey skates from all of the top hockey skate brands like Bauer, CCM and many others. To learn more about how we can help you get properly fitted for a pair of skates, visit one of our locations or take a look at our “How to Get Fitted for Hockey Skates” guide for more information. Our team of professionals at Gunzo’s are here to help you every step of the way. Visit us in person to see the difference yourself. Hockey stick technology has come a long way. We have been around to see the entire industry transform. Let one of our seasoned customer service representatives guide you to the perfect stick. No need to make an appointment. Bring your skates in and we’ll sharpen them while you wait (about 10 to 15 minutes). If by chance there’s a backlog of skates to be sharpened, you may leave them with us and we’ll sharpen them as soon as possible and call you when they’re ready.